The linking of breath and movement in vinyasa yoga helps to circulate blood, oxygen, and energy in the body. We feel, perhaps, that we find an inner source, like a spring, from which streams or wells forth the energy that fuels the work that we are doing with the body. We move through sequences in which poses are always paired with counter-poses that expand and contract, rise and descend, advance and retract, as the ocean tide. We start to find balance between strength and flexibility, effort and ease that permits us to bend and contort (deform) the shape of the body without cracking the bones or rupturing the joints or muscles. Finally, with all of the tension wrung out of the body, we can let go completely, and often practice inverted poses which help us to hang upside-down (in inversions) and find the full length of the spine. People often report getting taller after just a few months of practicing yoga! And with practice, we also learn to flow like water through not only the poses but perhaps our everyday life, finding balanced strength and flexibility that enables us to advance and abound which smoothly negotiating obstacles in our path without getting stuck. 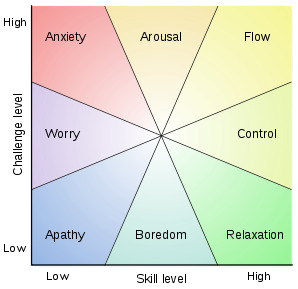 Flow also appears as a concept in psychology, and describes a state in which there is an optimal equilibrium between a challenge and one's skills to meet the challenge. In the vinyasa style of yoga, we challenge ourselves to find the edge between what is possible and impossible for us physically, and to play or dance at our own personal edge. This is the element that keeps us energized, engaged and healthy, while we also are able to progress and grow. It is also a mental challenge to find a place in difficult poses where the challenge is just enough that we can stay there and breathe for a certain amount of time, to not be too lazy so that it is too easy or work too hard so that we do ourselves harm (ahimsa, non-harming or non-violence, being one of the central principles of yoga!). Once we do manage to find that delicate balance - not too easy, not too hard - we might find ourself entering a kind of meditative state in which all of our thoughts, worries, and preoccupations fade away and we are fully engaged in the here-and-now. A flowing vinyasa practice is truly meditation in motion.